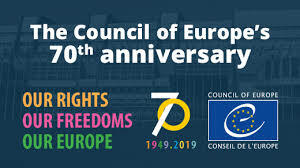 2019 marks the 70th anniversary of the foundation of the Council of Europe (CoE). For that occasion a new website has been launched with the aim to be a place to explore European history, understand the Council of Europe's mission and learn how its work is as important now as it ever was. The website is available in English version, but it will be soon translated in French language. Every month a new video will be published to see how the Council of Europe has changed the lives of millions of Europeans. It will also be possible to access the CoE’s archives in order to discover the organization’s story. The new website allows to participate to photo or essay competitions and take a trip through CoE’s Strasbourg headquarters thanks to a virtual online visit.